Former IDF Chief of Staff speaks at Limmud FSU event, says Jerusalem will always be Israel's capital. 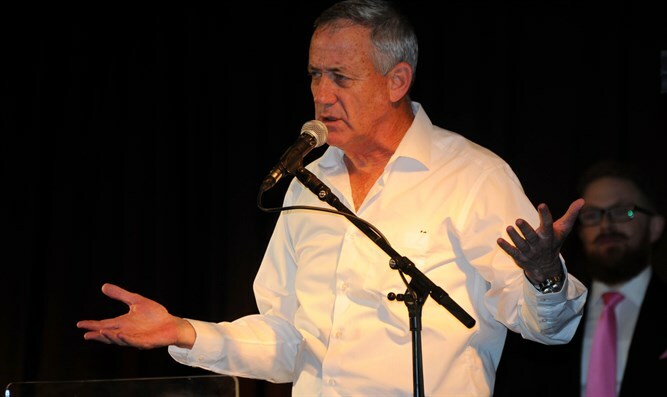 Former IDF Chief of Staff Benny Gantz spoke on Thursday evening during the 10th Limmud FSU event in Eilat. In his remarks, Gantz responded to the UN General Assembly’s approval of a resolution rejecting U.S. President Donald Trump’s recognition of Jerusalem as Israel’s capital. Gantz told the 2,000 young people attending the conference of the challenges Israel faces, including the social challenge and the difficulty in bridging the great gaps that have developed in Israeli society. "After Operation Protective Edge I visited the bereaved families. I saw among them religious and secular, rich and poor, Sephardim and Ashkenazim, Jews and non-Jews,” said the former Chief of Staff. “What I learned from this is that there is room here for mutual happiness for all and for living together. We must learn to live together, and this framework, which is called Zionism, must know how to contain everyone,” he continued. Gantz spoke about the security challenges facing Israel and said that "Israel's security challenges have changed over the years. They were different when it was established, they were different when I enlisted, and they are different today. The State of Israel will always be the strongest country in the Middle East and will always know to adjust its responses to every possible threat." He stressed the importance of preserving the special connection with Diaspora Jewry and not causing a rift. "We must maintain a positive relationship with the nations of the world, and the Jewish communities in the world are our partners in the Zionist enterprise. The fact that we live here does not mean we do not need Diaspora Jewry," stressed Gantz.